This is due on November 30. Your score on this assignment can be used to replace your lowest non-test score. For periods 1-4-5, do 1-20 page 499. For periods 3-6, do 1-12 page 485. Attention honors students: The MESPOW for this week is #124. We will review some important concepts from last week, and then students will take notes as Benson explains acid rain. If you were gone, watch this video and then watch this one too. We will finish watching the video "From the Ashes" (2017 National Geographic). We will go over the recent "WS: Temperature" and then students will take notes as Benson explains temperature inversions. If you are gone, copy the notes and carefully read this web page (does not open on mobile devices). Benson will have a sub, so students will work on the study guide. We will review for a test on Monday (atmosphere topics). This is due on November 30. Your score on this assignment can be used to replace your lowest non-test score. For periods 1-4-5, do 1-20 page 499. For periods 3-6, do 1-12 page 485. Benson will be gone today. Students will do a worksheet. Students will watch the first half of a video called "From the Ashes" (2017 National Geographic). Unfortunately I cannot find it online. This is due on November 30. Your score on this assignment can be used to replace your lowest non-test score. For periods 1-4-5, do 1-20 page 499. For periods 3-6, do 1-12 page 485. Attention honors students: The MESPOWs for this week are #18 and #104. We will review some important concepts from last week, and then students will finish the Carbon Cycle Packet. It is due at the start of class tomorrow. We will go over the recent graph activity and then students will listen and take notes as Benson explains "The Hole in the Ozone Layer". If you were gone, get a copy of the notes handout and copy the notes from a classmate, read this web page and watch this video,and the video of the week below. Benson will show students a demonstration, and then students will continue to take notes and learn about the hole in the ozone layer. If you were gone, copy the notes from a classmate and read this web page and be sure to select the arrow to watch the change over several years. Then watch this 4.5-minute YouTube video. If you would like to know more about skin cancer, click here. Also watch this video -> How the Sun Sees You. We will do a lab to help students understand the heating of land and water. 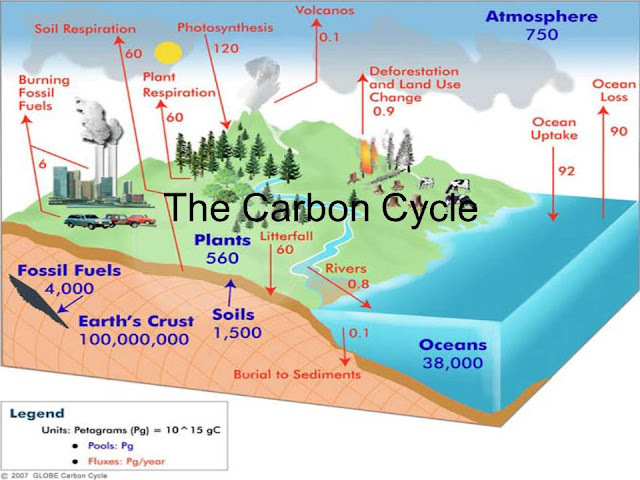 We will go over the Carbon Cycle packet, and then students will watch a 20-minute video about "Ocean Acidification". November 5-9: Second quarter begins! This is due on November 30. Your score on this assignment can be used to replace your lowest non-test score. For periods 1-4-5, do 1-20 page 499. For periods 3 and 6, do 1-12 page 485. After a brief introduction, students will do a WS. Students will take notes during a presentation on climate change (aka "global warming"). Periods 1-4-5 should read pages 602-603. Periods 3-6 should read 594-601. Also, check out this climate change graphic and watch this 2.5 minute YouTube Video. Students will work on a graph activity - "Climate Data from the Past". Students will be working on a Carbon Cycle Activity.